It is not too hard to reduce weight, but a person needs to know certain things. Actually, only one is needed – reducing weight is all about eliminating bad eating habits. Bad eating habits are directly linked to certain lifestyle which includes sitting a lot (at job, at home, in front of TV or computer monitor etc.). And if a person is not even periodically physically active, obesity emerges easily. Performed workout should be effective, but how to accomplish that? Cardio workout has to be done for at least 30 minutes for a fat burning process to start. Cardio should be better for fat burning because is activates almost all muscles in the body and therefore, more calories are used for creating energy. Cardio workout should include running or spot jogging. Spot jogging is really an excellent exercise and it is even used in more or less all training sessions, at least as a warm up part. Spot jogging can be done the entire session, because it has many variations. For example, spot jogging can be done with little jumps side to side, back to front, front to back, etc. These jumps can be done with legs positioned next to each other, but it can also be performed with alternating legs. Also, spot jogging can be done with jumping as high as possible, with raising knees when the body is in the air. Even though this is pure cardio workout, core is also strengthened with this exercise. Also, while spot jogging is done, arms can be stretched and extended for preparing the muscles for the next training phase. But, even though spot jogging is quite effective when it comes to fat elimination, there are also some devices that might help even more. 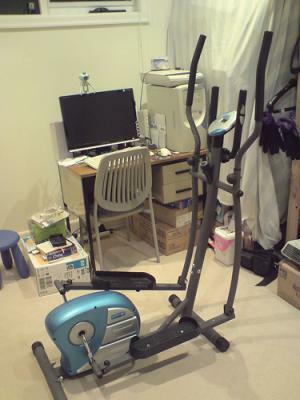 One of those is elliptical trainer. It is a very interesting machine because it incorporates several activities into one (running and ski motions being the most noticeable). Elliptical trainers should be even more effective than treadmills because they use arms a bit more. There are two vertical bars/handles that follow the motions of feet panels, so arms are constantly going back and front, which also consumes some energy. Because arms and feet are constantly moving, the torso is also active. It is very important to change the tempo of elliptical workout, to create a cross training session. Elliptical cross trainers – diversity makes the machine very effective when it comes to fat burning, much more than keeping the same tempo through the entire session. Also, elliptical trainers are a bit safer than treadmills because there is no pressure on the feet, ankles and knees. In one word, they are a must have if a person is starting with a weight reduction process. Best way to increasing speed/pace per mile? Do I have too many hard days in a row in my 5k schedule?